Deputy Prime Minister Trinh Dinh Dung laid stress on the urgent need to build 500kV transmission lines running through Ha Tinh, Quang Binh, Quang Tri, Thua Thien-Hue, Da Nang, Quang Nam, Quang Ngai, Kon Tum and Gia Lai to meet increasing power demand, especially in the south. He made the statement while attending a ceremony held in the central province of Quang Nam on December 18 to kick start three 500 kV transmission line projects, namely the Quang Trach – Vung Ang transmission line and the 500kV distribution yard at Quang Trach Power Centre, Quang Trach – Doc Soi transmission line and Doc Soi – Pleiku transmission line. There is a disparity in power supply and demand in various regions, he said, pointing that although the electricity consumption in the south reached 90 billion kWh in 2018, or 47 percent of the total consumption, its power generation is able to meet only 35 percent of the demand. Meanwhile, 60 percent of the country’s electricity is sourced from northern and central localities, whose electricity consumption made up of 53 percent of the total. “Upon completion, the 500kV transmission lines from Vung Ang to Pleiku 2 will ensure sufficient electricity for production and daily life in the south,” Dung underlined. As this is a complicated project, he asked the Ministry of Industry and Trade to coordinate with the Ministries of Construction, Agriculture and Rural Development, and Natural Resources and Environment to remove bottlenecks for the investors in a timely manner as well as direct them to carry out the construction in accordance with current regulations. Local authorities should support and join hands with the investors and contractors in land clearance and compensation processes, ensuring stable livelihoods for local residents after resettlement, he added. 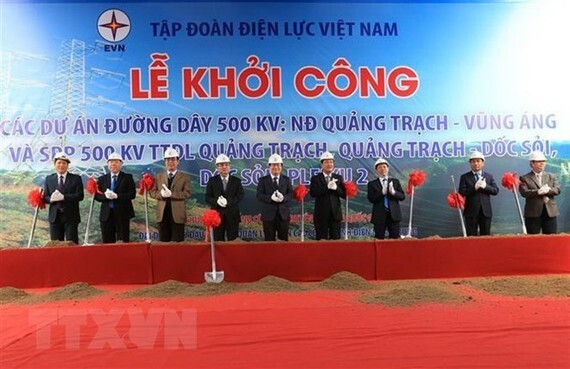 According to the National Power Transmission Corporation (EVNNPT), nearly 742 kilometres of 500KV transmission lines will be built under the three projects, running through nine localities of Ha Tinh, Quang Binh, Quang Tri, Thua Thien-Hue, Da Nang, Quang Nam, Quang Ngai, Kon Tum and Gia Lai. They will be carried out in 20 months at the total investment of nearly VND12 trillion ($515.5 million ). The ENVNPT is the investor of the projects.